Profile: Cole Bartiromo is a bright student-athlete with an affinity for trading sports cards. Friends, coaches are shocked by 'choir boy's' alleged role. Even by most teenagers' hectic schedules, Cole Bartiromo would have been hard to keep up with. In November, the 17-year-old from Mission Viejo was going to high school, attending baseball practice every weekday morning, pet-sitting for a family next door, flipping pizzas at a neighborhood restaurant and, according to federal authorities, masterminding an elaborate online investment scam that swindled more than $1 million from investors worldwide. If what the SEC said in its civil complaint is true, Bartiromo is as stealthy as he is sweet, as unscrupulous as he is industrious, as arrogant as he is reserved. Yet not even his closest baseball teammates seemed to have an inkling that there was anything out of the ordinary in Cole's life. Cole brags about being one of 14 people Jodi Arias followed on Twitter, likely because he was helping her scam individuals on the outside...and their psycho-pathetic kinship. Another very scary aspect to this webpage, Cole outs a big lottery winner and then starts a fan page where requests for money are posted. After reading about his MANY scams, I believe all those requests were likely from him, hoping (as he states), she would grant some of them. Cole has a twitter page where he spams his followers with his latest breaking news. This week it was the pictures of the innocent family George helped pull from the car. On his twitter page: Consultant, Author, Guest Speaker. Cousin of CNBCs Money Honey, the former teen mastermind made national headlines starting @ 15 in route to becoming the DS. On January 7, 2001, the SEC obtained permanent injunctions and asset freezes against Cole A. Bartiromo and Invest Better 2001 (IB 2001) in connection with their fraudulent and unregistered offering of securities over the Internet. The SEC alleged that the defendants raised over $1 million from more than 1,000 investors by promising "risk-free" investment programs in which IB2001 pooled investor funds to bet on sporting events. The defendants promised to repay investors between 125% and 2500% of their principal within specified periods. On December 13, 2001, as part of its "real time" enforcement initiative, the SEC filed an enforcement action to stop an ongoing fraud by Invest Better 2001 ("IB2001"), before having identified the individuals behind the scheme. Today, the SEC amended its complaint to add Cole Bartiromo ("Bartiromo"), a 17-year-old high school student, who the SEC has now identified as a principal behind IB2001as well as an additional defendant. In a settlement also announced today, the SEC is recovering from Bartiromo approximately $900,000 obtained from investors in the scheme. One article indicated Cole's father, John, allowed Cole to use his stock program...I think maybe his father knew more than what's been documented - maybe John Doe 1 or 2? Looking back, (5:00 here) he saw his victims as "simple people" who gambled against a "master player" and lost. The US Attorney who prosecuted Cole says "he has no empathy for his victims". Sociopath...did I mention he called what Jodi Arias did an "accident"? In fact, notice his Jodie-esque performance beginning at 10:00 on the video When Does Stock Hype Become Stock Fraud? Teenager gets three years for eBay scam A Californian teenager was sentenced to three years for defrauding users of eBay's auction services. 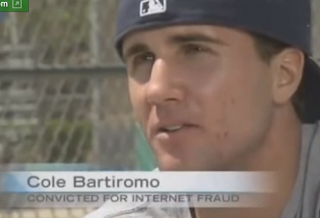 The 19-year old, Cole Bartiromo, was ordered to pay $20,000 back to his victims and spend 33 months in prison. The teenager pleaded guilty in February to putting items up for sale on eBay, collecting payment and not sending out the goods. He was also found guilty of bank fraud for trying to convince a Wells Fargo employee to wire $400,000 to an offshore account he had set up. "Bartiromo comes across as earnest and enthusiastic – not slick." Part of his master plan for success, however, includes paid speaking engagements, a book, a reality TV show, a web site – even a clothing line – under the brand name "The Dollar Scholar." (A web site, www.dollarscholar.com, will debut soon). Cole tries to quell the rumors with a personal page about himself - he distorts the truth and forgets to mention the embezzlement attempts and the ebay scam.. Hot Male for Female - a Craigslist ad (from Fed prison? ), by Cole B. Most interesting is this 2001 video with 16 (SEC filed charges in 2001), talking about two Tiger Woods sports cards that he and his dad, John Bartiromo, sold for six figures to an undisclosed buyer. His Linkedin is pretty amusing, especially his resume entries for the years he spent in jail. As for what he is doing now, he is still up to his old tricks. The SEC is no doubt watching him due to the investors he bilked knowing he's off probation and on the Internet. I suppose he's aware and just doesn't care - Cole is arrogant and self-absorbed, empathy and remorse are not a sociopath's strong suit. It's amazing how many people admire a scammer - do they realize, or care, he stole money from individuals? I, unlike Cole, do have feelings or I would post his sisters pictures and the grandbaby's pictures here for all to see - but, like the children in the rollover accident involving George Zimmerman, they've done nothing to deserve their privacy and safety being invaded. Cole left his family destitute from his "masterminding" a swindle - again, he just doesn't care. I imagine he'll spend the rest of his life in prison, the sooner the better. Another Fool for A Client Bartiromo, at age 18, represented himself in seeking $50 million in damages from his high-school for not keeping him on the baseball team after the SEC debacle. MISSION VIEJO, Calif. (AP) - A teenager who was accused two years ago in a $1 million US securities fraud scheme has now been charged with conspiring to steal from a local bank. Federal prosecutors say 19-year-old Cole Bartiromo and two friends tried to persuade an employee at a Wells Fargo bank in Mission Viejo last August to let them "borrow" all the money in a bank customer's account. Court documents say Bartiromo told the employee, identified as Thorsten Kuklinski, that Bartiromo was to wire the money overseas, make a profit by gambling on the Internet, then return the original money "before the account holder was aware the money was missing." Kuklinski told his supervisors, and prosecutors set up a sting, in which they say Bartiromo was caught wiring $450,000 from a fake account to carry out the scheme. Bartiromo denies wrongdoing, alleging entrapment by federal authorities. "I just want a second chance and they're trying to destroy me and my family," he said. Another trait of a sociopath, nothing is ever their fault - always the victim. A Sociopath in the truest form, Cole Bartiromo released pictures of the family George Zimmerman rescued from an overturned SUV shortly after Zimmerman was found not guilty of 1st degree murder. He not only put up pictures of the two adults who were in the crash, he also posted MANY pictures of their small children as well. For obvious reasons I am not going to post a link. He tweeted the pictures to at least 1,000 people yesterday. Just a few minutes ago proudly tweeted that the cop and woman involved in the accident have deleted their facebook page - he attributes this to their hiding something - I attribute it to their fear of his stalking them and posting their private lives all over the Internet. This person, for no other reason than to get publicity for his websites, put these kids in serious danger because there are nuts who would hurt them just because of Zimmerman. 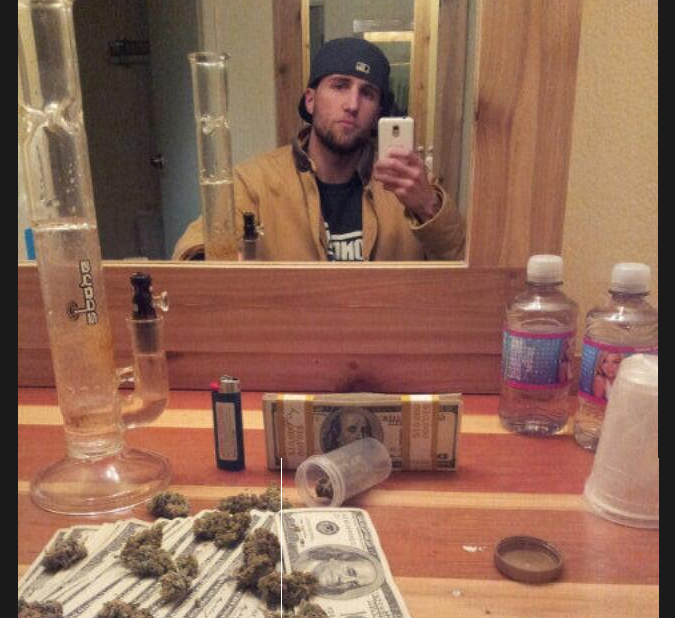 My research shows he is likely a sociopath, just like his friend Jodi Arias. He often refers to himself as a "mastermind" - to which I say, dude, a mastermind doesn't get caught in a month. I understand Cole B has done wrong, i do believe that at a short age him being able to mastermind something like that i believe he is very intelligent. I feel he could use his intelligent into something more productive and positive. as to the pictures he posted about zimerman, let me remind you you are doint the same by posting his father's name. I am under the impresion you are a Zimmerman supported and you are upset because Cole claim Zimmerman fake the accident. something that NOT only cole believe but a lot of people too. Zimmerman is and always will be a killer, regardles if you like it or not. Zimmerman and his followers including you will rot in hell and that is all i have to say. Masterminds don't get caught swindling that much money before they can even spend it. Masterminds get caught after years of swindling. He's still doing it online. He pulled the ebay scam and he's likely still selling pictures of items he never intends to deliver. As for why I was upset with Cole, he posted the pictures of the two little children from the wreck that George made the news helping to save. Works both ways. the only thing that bothers me about him the way he supports jodi arias and it just doesn't get to my mind HOW he justifies her actions as an "accident". He's just like hodi - psychopath delusional and straight up CRAZY! It's necessary to beware people from such schizophrenic persons. Just Google his name and that will give you stories over years. He scams and he is thinking everybody is stupid. One day he will find his master.